Earthquake Report: Southeast Indian Ridge! While at the HSU Geology Club Rock Auction last night, there was a large earthquake south of the SE Indian Ridge, between the SE India Ridge and the Kerguelen Plateau. Here is the USGS web page for this M 7.1 earthquake. The SE India Ridge is an oceanic spreading center where oceanic crust is formed between Australia and Antarctica. I placed a moment tensor / focal mechanism legend in the lower left corner of the map. There is more material from the USGS web sites about moment tensors and focal mechanisms (the beach ball symbols). Both moment tensors and focal mechanisms are solutions to seismologic data that reveal two possible interpretations for fault orientation and sense of motion. One must use other information, like the regional tectonics, to interpret which of the two possibilities is more likely. Below is my interpretation map. I placed the USGS moment tensor near the epicenter plotted as an orange circle. I also label the Kerguelen Plateau (KP), Broken Ridge (BR), and the Ninetyeast Ridge. The Kerguelen Plateau and Broken Ridge are parts of a Large Igneous Province (LIP). LIPs are thought to form when a Hot Spot (HS) initially breaks through the crust. This initial HS volcanism leads to a very large volume of magma production and produce extensive flood basalts. Some of these are oceanic (e.g. Ontong Java Plateu) and some are continental (e.g. Columbia River Flood Basalts). I place a pair of dashed yellow arrows that show how these two parts (KP & BR) were earlier formed along the SE India Ridge. I also label the Ninetyeast Ridge, which is an overthickened region of the India-Australia plate. We think that the crust is overthickened here because as the crust formed, it spread across a hot spot, creating thick oceanic crust. There is more about this LIP and the Ninetyeast Ridge in Frey et al. (2002). Based on the presence of northeast striking fracture zones (strike slip faults associated with differential spreading along the spreading ridge), I interpret this earthquake as a left-lateral strike-slip earthquake. I could be wrong. I do not have access to any high resolution bathymetry of this region, if it might exist, to help me interpret the structure of this region. We can remember that these data may not help us by taking a look at the largest strike-slip earthquakes ever recorded. These happened in April 2012, offshore of Sumatra in a region of the India plate oceanic crust between the Ninetyeast Ridge and the 2004/2005 Sumatra-Andaman subduction zone earthquakes. Here is a map of the Indian Ocean that shows the age of the oceanic crust in color (Bernard et al., 2007). Here is a map from some GSA publication (but they do not list where it is from, so I cannot really provide a reference. here is the link). This map shows the global distribution of LIPs, colored vs. their classification (continental, silicic, and oceanic). Frey et al. (2002) is an IODP summary report for analyses of basalts collected along this LIP and the Ninetyeast Ridge. Below I place their figure caption in blockquote. Basalt provinces in the eastern Indian Ocean. Oceanic features attributed to the Kerguelen plume include the Kerguelen Plateau, Broken Ridge, Ninetyeast Ridge, Kerguelen archipelago, and Heard and McDonald Islands. Several continental basalt provinces have also been associated with the Kerguelen plume; these include Cretaceous lamprophyres in Antarctica and northeast India (solid diamonds), the Rajmahal Traps in northeast India, and Bunbury Basalt (BB) in Southwest Australia. Solid circles = locations of igneous basement sites drilled by DSDP and ODP, open circle = Eltanin piston core. Also indicated are dredge locations (solid squares = igneous rock recovery, open square = sediment dredge by Petuna Explorer). NKP, CKP and SKP = northern, central, and southern Kerguelen Plateau, respectively. Frey et al. (2007) plot the summary of the ODP drill holes to basalt formed in this region. Below I place their figure caption in blockquote. Summary of ODP drill holes on the Kerguelen Plateau and Broken Ridge that recovered volcanic rocks from the uppermost igneous basement (see Fig. F1, p. 36, for locations). Data for Leg 183 (Sites 1136, 1137, 1138, 1139, 1140, 1141, and 1142) are from Coffin, Frey, Wallace, et al. (2000), Coffin et al. (2002), and Duncan (2002). Data for other sites are from Barron, Larsen, et al. (1989), and Schlich, Wise, et al. (1989). Radiometric ages (40Ar/39Ar) for mafic volcanics are in bold. Frey et al. (2007) plot the volume of basalt formed in this region. Below I place their figure caption in blockquote. Estimated Kerguelen hotspot magma output since 130 Ma (Coffin et al., 2002). Analytical uncertainties for 40Ar/39Ar ages are variable, but 2-values are generally <5 m.y. Therefore, ages were assigned to various portions of the province (Fig. F1, p. 36) in 5-m.y. bins (diamonds) for the purpose of calculating the hotspot magma flux. The dashed line between 95 and 85 Ma indicates assumed Ninetyeast Ridge crust of that age buried beneath the Bengal Fan, produced at the same rate as Ninetyeast Ridge and Skiff Bank crust from 85 to 35 Ma. Their LIP volume vs. time plot is similar to that from the Columbia River Flood Basalt Group volume vs time. Below is a plot from the Martin et al. (2005). Below I place their figure caption in blockquote. Volume of Columbia River Basalt Group Eruptions Over Time. R1, N1, R2, and N2 are magnetostratigraphic units of the Grande Ronde Basalt. Frey et al. (2007) show their interpreted plate motion reconstruction. These maps show the configuration of the LIP through time. Below I place their figure caption in blockquote. Plate reconstructions of the southern Indian Ocean region of Coffin et al. (2002), using the hotspot reference frame of Müller et al. (1993). Red stars = possible reconstructed positions of the Kerguelen hotspot (after Müller et al., 1993); those labeled “K” assume that the Kerguelen archipelago is the current location of the Kerguelen hotspot, and those labeled “H” assume that Heard Island is the hotspot’s current location. Black shading = magmatism associated with the Kerguelen hotspot, diamonds = lamprophyres (labeled with “L” in 110 Ma panel) as they have appeared through geologic time (see Fig. F1, p. 36, for current locations of individual igneous complexes). Dashed line = a possible northern boundary for Greater India. IND = India, ANT = Antarctica, AUS = Australia. A, B. Seafloor spreading initiated at ~133 Ma between Western Australia and Greater India and at ~125 Ma between Australia and Antarctica. This model assumes breakup between India and Antarctica at ~133 Ma, although the timing of this event is not well known. The Bunbury Basalt (BB) of Southwest Australia erupted close to these breakup events in both time and space. Continental portions of Elan Bank (EB) and the Southern Kerguelen Plateau (unknown dimensions) remained attached to Greater India at these times. The Naturaliste Plateau (NP) also contains continental crust. C, D. Seafloor spreading continued between India, Antarctica, and Australia. 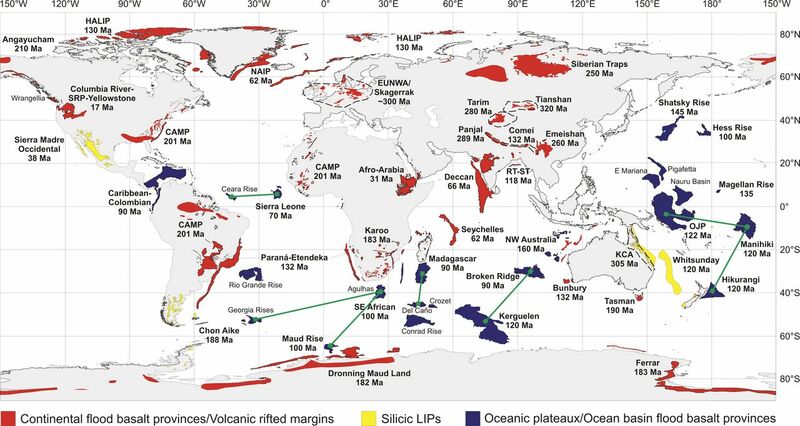 The initial massive pulse of Kerguelen magmatism created the Southern Kerguelen Plateau (SKP), the Rajmahal Traps (RAJ), and Indian/Antarctic lamprophyres (L) from ~120 to ~110 Ma (Fig. F3, p. 38) and may be linked to breakup and separation between Elan Bank and Greater India. The Central Kerguelen Plateau (CKP) formed between ~105 and ~100 Ma and Broken Ridge (BR) between ~100 and ~95 Ma (Fig. F3, p. 38). Igneous basement of the Wallaby Plateau (WP) is not well characterized geochemically and has not been dated, but its age is inferred to lie between ~120 and ~100 Ma (Colwell et al., 1994). E, F. The hotspot generated the Ninetyeast Ridge (NER) and Skiff Bank (SB) as India continued its northward drift relative to Antarctica. G, H. At ~40 Ma, seafloor spreading commenced between the Central Kerguelen Plateau and Broken Ridge. The hotspot generated the Northern Kerguelen Plateau (NKP), and, since 40 Ma, as Broken Ridge and the Kerguelen Plateau have continued to separate, has produced the Kerguelen archipelago, Heard and McDonald Islands (Fig. F1, p. 36), and the chain of volcanoes between Kerguelen and Heard (Weis et al., 2002). Coffin, M.F., Pringle, M.S., Duncan, R.A., Gladczenko, T.P., Storey, R.D., Müller, R.D., and Gahagan, L.A., 2002. Kerguelen hotspot magma output since 130 Ma. J. Petrol., 43:1121–1140. Duncan et al., 2002. A time frame for construction of the Kerguelen Plateau and Broken Ridge. J. Petrol., 43:1109–1120. Frey et al., 2002. Kerguelen Plateau. Larson, R.L., 1991. The latest pulse of Earth: evidence for a mid-Cretaceous superplume. Geology, 19:547–550. Martin, B.S., et al., 2005. Goldschmidt Conference 2005: Field Trip Guide to the Columbia River Basalt Group. Müller, R.D., Royer, J.Y., and Lawver, L.A., 1993. Revised plate motions relative to the hotspots from combined Atlantic and Indian-Ocean hotspot tracks. Geology, 21:275–278. Schlich, R., Wise, S.W., Jr., et al., 1989. Proc. ODP, Init. Repts., 120: College Station, TX (Ocean Drilling Program). Wallace, P., Cervantes, P., Weis, D., Ingle, S., Frey, F.A., Kieffer, B., and Moore, C.L., 2000. Explosive felsic volcanism on the Kerguelen Plateau (ODP Leg 183): geochemical characteristics and pre-eruptive volatile contents. EOS, Trans. Am. Geophys. Union, 81:432. Weis, D., Frey, F.A., Schlich, R., Schaming, M., Montigny, R., Damasceno, D., Mattielli, N., Nicolaysen, K.E., and Scoates, J.S., 2002. 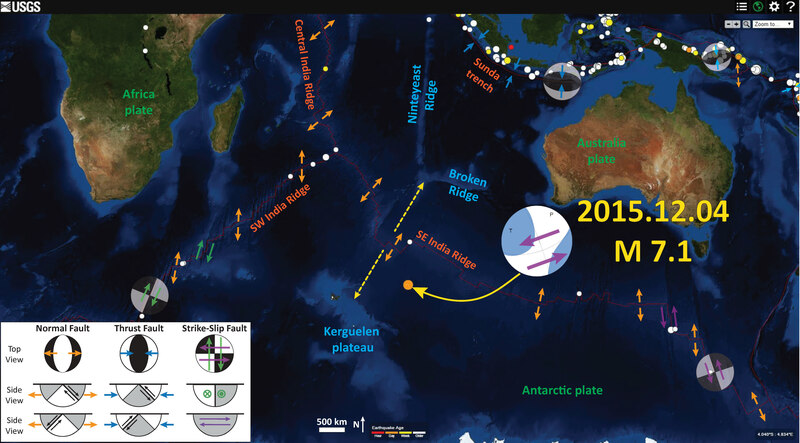 Trace of the Kerguelen mantle plume: evidence from seamounts between the Kerguelen archipelago and Heard Island, Indian Ocean. Geochem. Geophys. Geosystems, 3 (Article), 10.1029/2001GC000251.